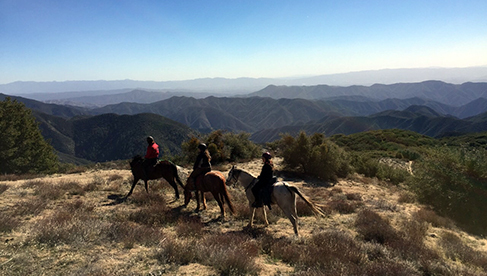 This equestrian vacation destination is based in the remote and vast Angeles National Forest in the world-class city of Los Angeles. 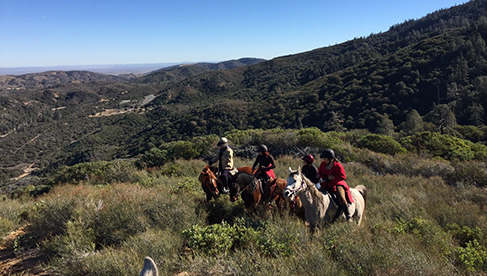 This California ranch’s location is unique since guests can enjoy the best of both city safaris and horseback riding safaris. 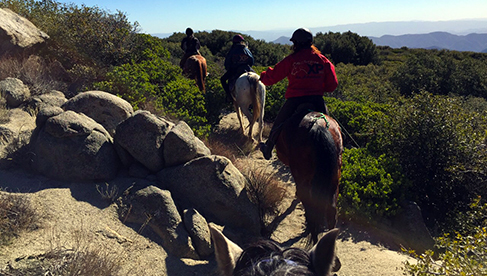 You will be riding on long, quiet mountain trails following the world famous Pacific Crest Trail on some days in southern California. Flora and fauna includes oak trees and Jeffrey Pines and at higher elevations the exotic yucca plant! If the views are clear and the ocean fog has settled, chances are you might get to see the Pacific Ocean. 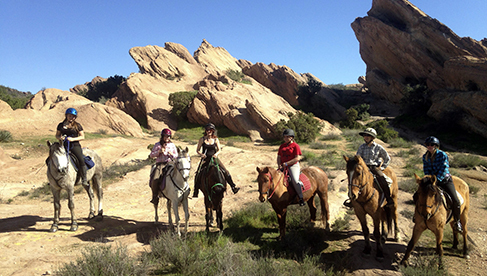 Running Horse Ranch takes guests to the famous Vasquez Rocks, impressive rock formations that Hollywood movie producers have regularly used for film scenes, commercials, and music videos. 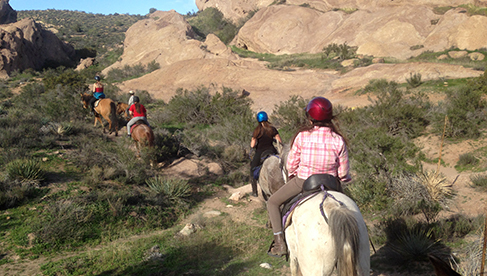 With some luck, you may encounter a production company working on a movie during your horseback riding tour! 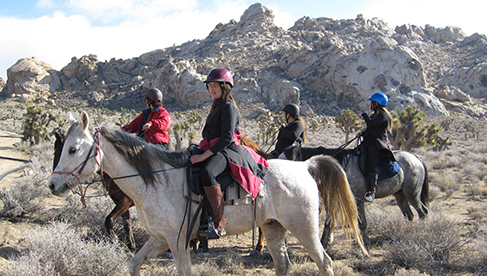 The nearby Mohave Desert showcases other diverse landscapes and beautiful Joshua Trees. The arms of this peculiar tree grow upright, giving the tree a unique look. Ride on wide sandy roads and inviting riverbeds. 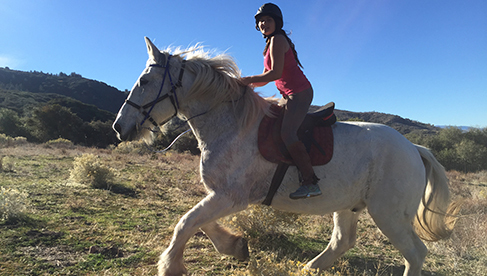 After you explore the historic, scenic surroundings of the greater Los Angeles area on horseback, relax on your porch, work on horse conditioning or if the possibility comes around watch how a horses hoof gets trimmed. Additionally, you could take a scenic drive to to LA and visit the beach, Universal Studios or Hollywood. The ranch owners enjoy giving guidance and advice for points of interset. Did you know Los Angeles offers over 800 museums? Many of them are free of charge. 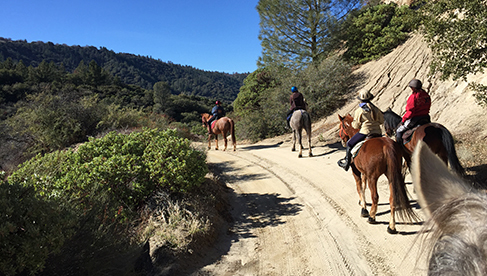 Running Horse Ranch’s owners are happy to share their local knowledge with you to give you an interesting California horseback riding vacation. Enjoy half day rides, full day rides or three to five day riding holidays. 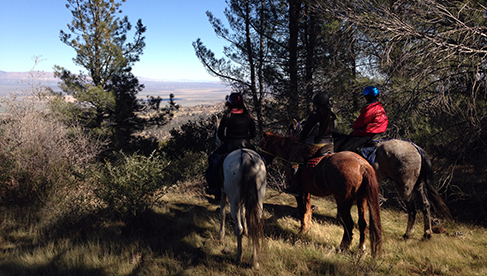 Horseback Riding Adventure Trip- The Best of Both! 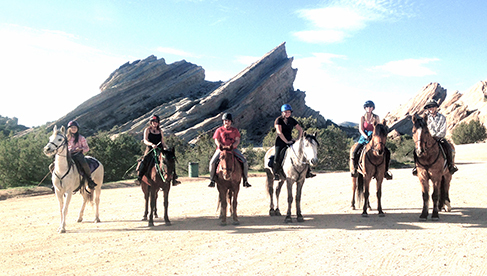 If you prefer not to drive through the sometimes chaotic city of Los Angeles or you don’t have a drivers license- Running Horse Ranch makes it easy and provides transfer to and from the airport, interesting day trips to town, and guided sight-seeing tours. A car rental is not necessary. 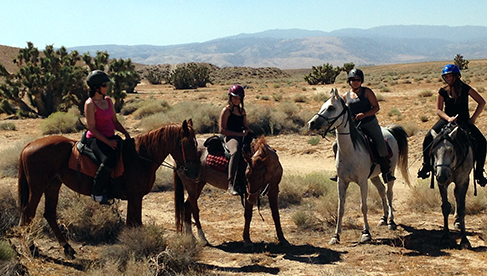 Additionally, this California riding holiday offers full catering/ all meals. For guests that like an independent riding vacation, you have a kitchen in your cabin. The choice is yours. Cabins and luxury tents with full camping gear, cooking stove and beds. Ranch offers catering service if you wish. Breakfast, lunch-picnics, barbeque dinners on the ranch for additional cost. Kitchens in cabins and tents. Upscale dinner restaurants in town. 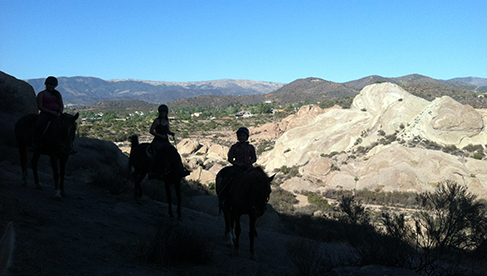 Horse riding, sightseeing, pony rides, beaches, museums, ranch activities. This is a great vacation for women travelers, and people that want not to worry about driving while visiting Los Angeles. Angeles National Forest, Beaches, Los Angeles, Santa Monica, Venice, Hollywood, Universal Studios, pony walking, zip line, skiing, wine tasting! Learn more and check out the most up to date rates & details.